- the pirates are winning. We are on a journey, sailing from Thailand to the Mediterranean Sea via the Red Sea, and are presently stopping in the northern Maldives where cruisers traditionally have used to take a break and get some rest before the crossing of the Arabian Sea to the Gulf of Aden and further through Bab El Mandeb to the Red Sea. The map shows all the piracy and armed robbery incidents reported to the IMB Piracy Reporting Centre during 2011. Our position, as we write, is indicated by the arrow. The map here is only a static copy of a dynamic, interactive map on the Piracy Reporting Centre web page. On their page you can get details of the incidents, by zooming in and clicking on the pointers. During previous years, the Gulf of Aden between Salalah in Oman and Aden in Yemen, a strech of around 700 nm, has been considered as the dangerous area. Only a year ago, all yachts on this passage, several of them friends of ours, sailed the direct route from here in the Maldives to Oman. You were not supposed to be in danger until you departed from Salalah. The situation has now changed radically. The presence of warships operating in the Gulf of Aden has caused the pirates to range widely over the Somali basin and far into the Indian Ocean. The number of attacks in the gulf has dropped, but in other areas it has gone up substantially. 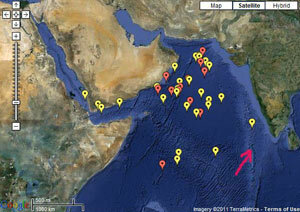 In hind sight we can see, that this trend started already in November 2010, but the full picture became clear only recently: in January 2011 more than 30 attacks on merchant ships were reported, as far north as 25N (near the coasts of Iran and Pakistan) and as far east as 67E (Indian waters). The reason that the pirates have been able to enlarge their territory to such extent is their use of captured ships as mother ships for their fleet of speedboats. The pirates are no longer limited by capability and capacity and there is now no boundary to their areas of operation. We are presently around 30 sailing vessels in Uligan, and I would estimate that there are more than one hundred yachts under way towards the Red Sea, including three rally groups: the Blue Water Rally, the Vasco da Gama Rally and the Thailand to Turkey group, each counting 25-30 participants. Most of the yachts here in Uligan have reported their intended passage to the authorities of MSHOA (Maritime Security Centre Horn of Africa), UKMTO (UK Maritime Trade Organisation) and MARLO (Maritime Liaison Office, US Navy), which all have tried to convince us not to undertake the trip - with particular reference to the recently increased and changed pirate activity. So, here we are sitting on an atoll in the Indian Ocean wondering what to do after having sailed non-stop for almost two weeks from Thailand. Ahead we would have an apparently enjoyable 8-9 days journey to Salalah, broad-reaching in a steady 15 knots of NE monsoon. But, are we really willing to accept the risk? A South African yacht was captured in October. Their crew is still kept as hostages for a ransom demand of 10 million USD. Alternative 1) Throw in the towel, and sail back to Thailand. Solution: This is not practical for as long as the NE monsoon is blowing, or until end of April. Alternative 2) Sail north along the west coast of India all the way to Pakistan and Iran, then turn west towards Muscat and after that SW along the Arabian peninsula to Salalah. A distance of 2,500 nm. Solution: This route would be hard on the wind until furthest north and the distance is twice that of the direct route. However, the Admiralty publication Ocean Passages of the World gives advice about sailing close (15-20 nm) to shore, avoiding the northerlies and taking advantage of the regular sea- and land breezes, but close to shore there is always the risk of getting caught in fishing traps and nets. This route is also not free of pirates, particularly on the crossing over to Muscat and down the coast of Oman, where several attacks have been reported lately. Making landfall in India also requires a visa stamped in your passport. Alternative 3) Sailing south through the Maldives to Chagos and thereafter to Mauritius and then around Africa. Solution: Well, this route is not leading to the Mediterranean in the near future, but rather to the Caribbean, a distance of maybe 10,000 nm. Visiting Chagos, which is a British Indian Ocean (military) Territory, is not allowed without a permit, which should be obtained in advance (anyone entering without a permit is liable to imprisonment for 3 years and/or a fine of £3000). Best time of the year for the Chagos-Mauritius passage would be May/June and for Mauritius-South Africa it would be early October. If you go earlier you may end up in a cyclone. Consequently you will have to spend around 4 months in Mauritius. From South Africa the normal route goes across the Southern Atlantic via Brazil to the Caribbean and then across the Northern Atlantic to Europe, where you would arrive in late summer 2012, about 18 months from now! Alternative 4) is a combination of 1 and 3: Saling south in the Maldives and possibly to Chagos before turning east and heading back to Thailand. Solution: Probably the easiest way to return to SE Asia if it is done when the NE monsoon is over. We appear to be at a dead end, with few positive alternatives. The situation doesn’t get better because of the fact that we are allowed to stay only 72 hours in the Maldives, a duration that we have by now consumed. As a matter of fact, we have already cleared out of the country and are still here only thanks to the mercy of the super friendly local officials. For their records, I have officially declared repairs as the reason for our delay. If there ever is an audit of the customs and immigration book of Uligan they will wonder why 30 yachts had engine problems in 2011. If we decide to sail down to Chagos through the Maldives, we have to “cancel” our outbound clearance and buy a cruising permit for around 700 USD. Several yachts have, in spite of the warnings, departed on the direct route to Yemen or Oman. They are sailing with no lights, with radar and AIS turned off and without using the VHF-radio. The radar reflectors have been dismounted and are hidden in the bilges. We have heard reports even of merchant ships sailing completely without lights - scary! 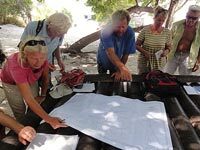 Each afternoon we, the refugees of Uligan, get together on the beach to share information and compare our charts where we have plotted the latest attack positions. The question we all are raising frequently is, how is it possible that the pirates appear to be winning, in spite that there are about 30 warships from a dozen countries in the area. We suspect that the naval forces are not doing all they could. Locating these mother ships and keeping them out of action should not be too hard using modern technology. If nothing else, use a submarine with (non explosive) torpedoes and shoot the rudders to pieces. This shouldn’t bring any possible hostages at risk. Or at least make their location public. However, there doesn’t appear to be a political will to put an end to this farce. We sure could use a man like Ronald Reagan again. We have heard stories of war ships encountering Somalis a thousand miles from shore in boats loaded with guns and no fishing gear. Apparently this was not considered proof enough of (intended) piracy. How stupid can it get? Resolution 1851 of the UN Security Council leaves room for little doubt when it calls all member states to actively fight, not only obvious acts of piracy outside of Somalia, but also get rid of boats, arms and other equipment where there is reasonable grounds for suspecting that they will be used for piracy or armed robbery. The unrests in the Arab world, particularly in Egypt, which appear to be escalating, give their own flavour to the soup. There are even fears that the Suez Canal will close. I don't think that is possible, at least not for long; too big financial interests are involved. We'll cross that bridge when (if) we get there and hope that they have sorted out their problems before we arrive. So, what are we going to do now? Good question, which I have answered differently every day. As I write this, I’m in the back-to-Thailand-when-the-monsoon-changes mood. Yesterday I was on my way to India and tomorrow maybe we are heading for South Africa. Because we believed that we now were on the last longer passage of our lengthy circumnavigation, it feels a bit disappointing to return to Thailand, and have the whole trip ahead of us again, which right now looks likely.